Italian surnames started to be used in Roman times. Before that, citizens were identified by their first names (in Latin praenomen) and their family names (in latin nomen). But when the population started to increase, some problems arose because many families had the same names. So, they decided to add surnames (in Latin cognomen) which derived from work activities, physical features, places of origin, and so on. Here you can find a list of the most common Italian surnames in alphabetical order. And if you are also interested in Italian first names, you can have a look at our list of Italian baby names and discover how to pronounce them through our YouTube videos. 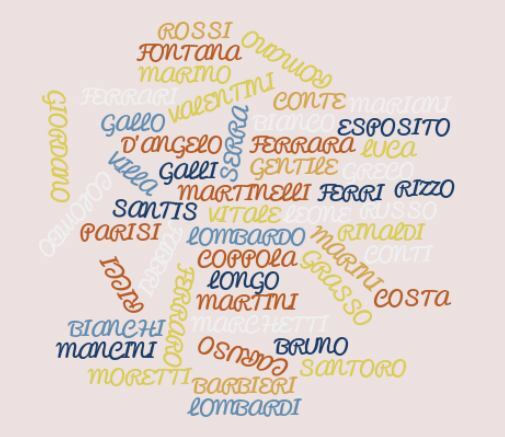 Discovering the most common Italian surnames is important because names and surnames are part of the Italian culture. 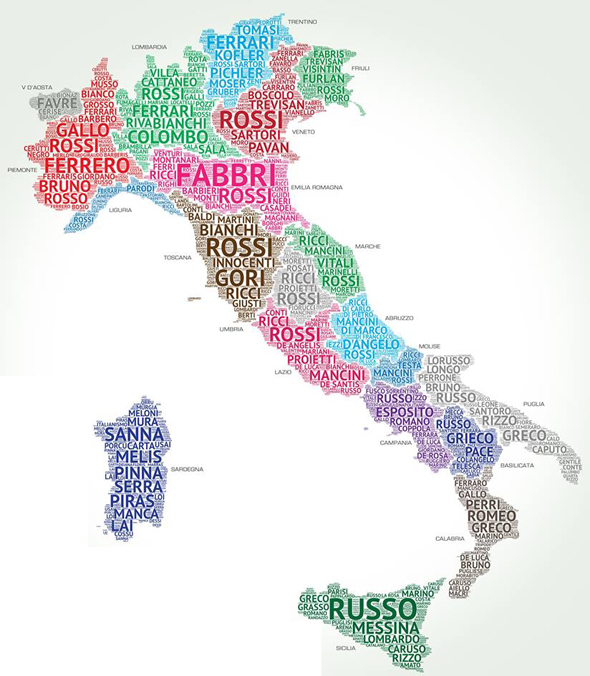 If you want to know more Italian surnames and discover their meanings and origins, click here. If you also want to know the distribution of Italian surnames in the different regions of Italy, look at the map below. Remember that at Parlando Italiano we offer one-to-one Italian lessons in London and Italian lessons by Skype. If you want to discover more about the Italian language and culture with the help of a native Italian teacher, take a trial lesson, or you just want to know more about our school, please contact us and we will be very happy to give you more information. This entry was posted in Italian culture and tagged Italian surnames, Most common Italian surnames by myitalianlessons. Bookmark the permalink.